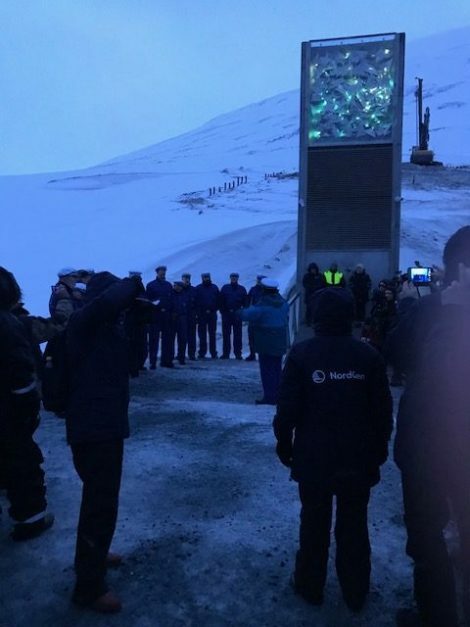 The Svalbard Global Seed Vault looks like something out of a James Bond movie but, in reality, is more humble than it appears in photographs. This becomes apparent when one realized the doors to the outside of the seed vault are only 7 feet high. This is not a bad time of year to remind people how best to store seeds. The old standby is Harrington’s rule — that the sum of temperature (in degrees Fahrenheit) and the percentage of relative humidity should not exceed 100, as this will shorten seed life. Over the years we have learned that temperature and relative humidity are not that directly related to one another and that this rule is an oversimplification. Nevertheless, when asked, seed savers usually say the best option is to store seed cool and dry – a tried and true general rule that can be easily met. 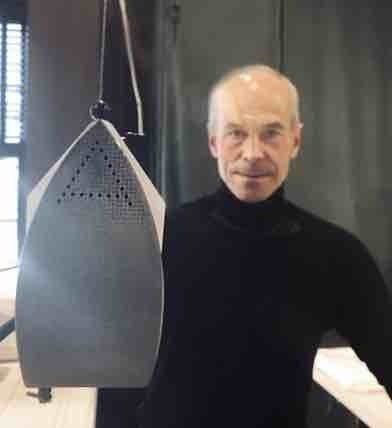 But another option for seed storage is to head to the Arctic Circle, drill out a cave in the glaciated mountains on Spitsbergen, an island in the Svalbard archipelago hundreds of miles north of mainland Norway and close to the North Pole, and create an agreement with dozens of other nations to store your seed collectively. This seems like a perfect solution until some foe of James Bond decides that your storage facility would make a great lair (so far we have avoided this last part). And for my peers at Seed Savers Exchange and at the USDA, that has been our approach. 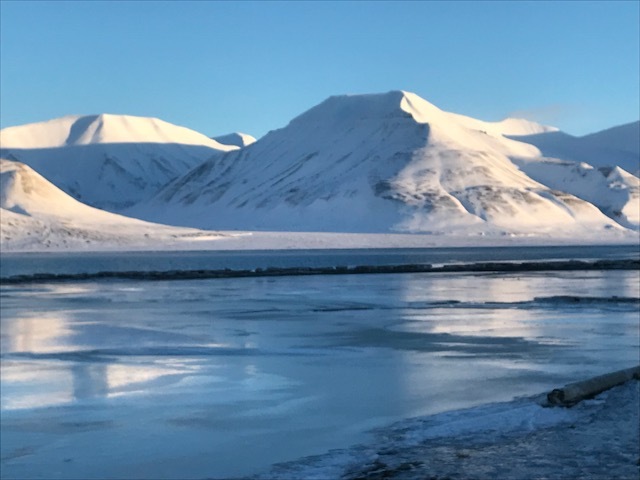 When the North Pole is closer than most of civilization, you know you are in Svalbard. 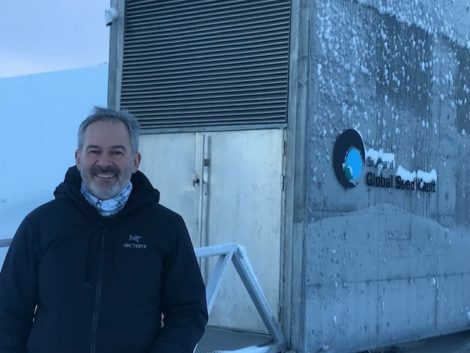 This past month was the tenth anniversary of the Svalbard Global Seed Vault, an idea brought to fruition as a backup facility for seed banks of the world by an international coalition led by seed activist Cary Fowler. Because Seed Savers Exchange is a depositor (and also the only NGO in the world with a considerable collection in storage there), I had the opportunity to visit and attend the conference and ceremony this past month as the one millionth seed variety was deposited in the vault. 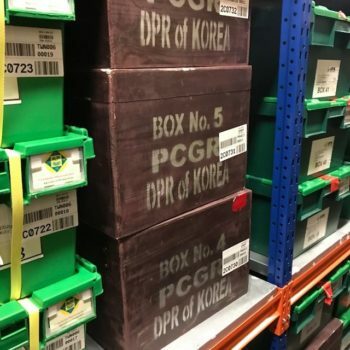 The vault, which houses seeds from nations ranging from the two Koreas and Australia to Italy, France and Taiwan, serves as an insurance policy for us all, holding seeds of essential legume, cereal, and grain crops along with the 3,500 vegetable varieties currently placed there over the past decade by Seed Savers Exchange. The vault behind these doors contains seeds from every continent but Antarctica. 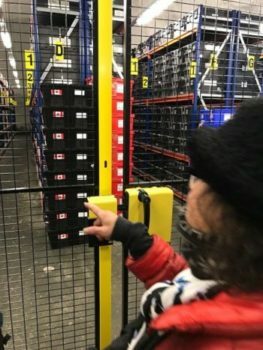 These seeds are being put into long-term storage at -17 degrees Celsius. (Do not try this at home unless you have a good way of testing the seed moisture content of your seeds. If the water content is too high, the water in the seeds will freeze and damage the seeds.) What is being stored is not simply the seeds themselves, but the genes that they contain. Each accession placed within the vault is an essential piece of the biodiversity of our food system, both in its current state and in its potential to be bred into new varieties. 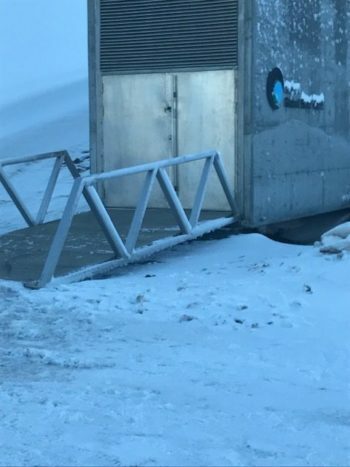 And although the press has characterized the vault as the Doomsday vault, a back-up should the world come to its end, in fact, the opposite is true. 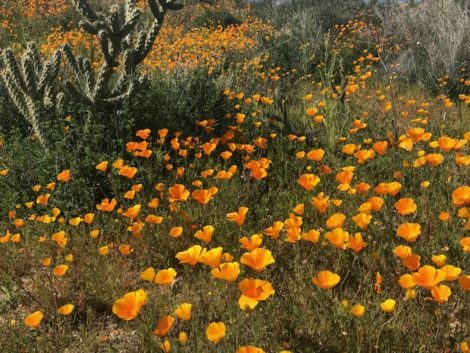 It instead, serves to insure that, should something happen to a variety in its place of origin or to the seed bank that houses it, the seeds can be withdrawn from the vault. The Arctic Circle is an ideal place to store seeds, provided their seed moisture content has been brought down to acceptable levels. Otherwise, the water in the seeds would freeze and damage the seeds themselves. Take, for example, the deposits of the International Center for Agricultural Research in the Dry Areas (ICARDA), which were backed up in Svalbard from the collection in Aleppo, Syria. At Svalbard, ancient landrace grains sat cheek by jowl in the vault with varieties of corn, beans and tomatoes from Iowa and Washington State. And when the ICARDA seed bank in Syria was no longer accessible (the seeds are still sitting there, just not accessible), seeds were simply withdrawn from Svalbard (the first and only occasion where a withdrawal has been necessary), and grown out to create more seed, which is now stored in two new seed banks in Morocco and Lebanon. The placement back into the seed vault this past month of many of these drought-resistant ICARDA varieties was a sobering and joyful moment for all of us who were there, and a reminder of why we should value our resources and steward them carefully, so that they are around for generations to come. The ceremony of taking the seeds into the vault. The men up front are not armed guards, but a Norwegian choir that managed to sing for a considerable time on the cold, windy night before we brought the seeds into the vault, showing us the hardiness that is inherent in their own genes. 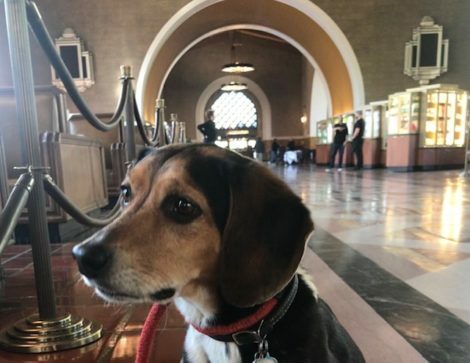 But, as we brought our seeds into the vault, I was overwhelmed by something else of equal value to me that had little to do with the ceremony, little to do with the idea of Doomsday and a lot more to do with hope. For as I walked the aisles, dressed in a lot more layers than I would need on a winter day in the Berkshires, taking in boxes of seeds from North and South Korea and Morocco, Lebanon and Canada, I saw a collection of people working across cultures to share what was essential to our collective future well-being. I almost shed a tear but, at -17 Celsius, I quickly realized that the stereotypic stoicism of our Nordic cousins was maybe more a matter of practicality than lack of emotion. 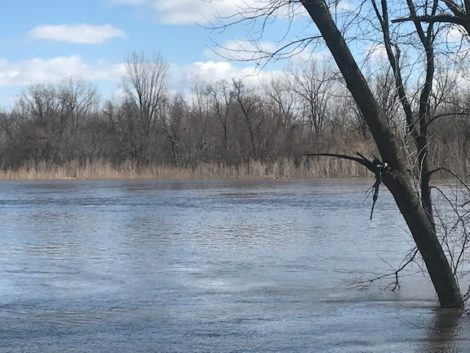 For, beyond the frozen tears on my face, a sense of hope and common purpose came into my mind and hopefully will be there well after the tears on my face have melted and dried. 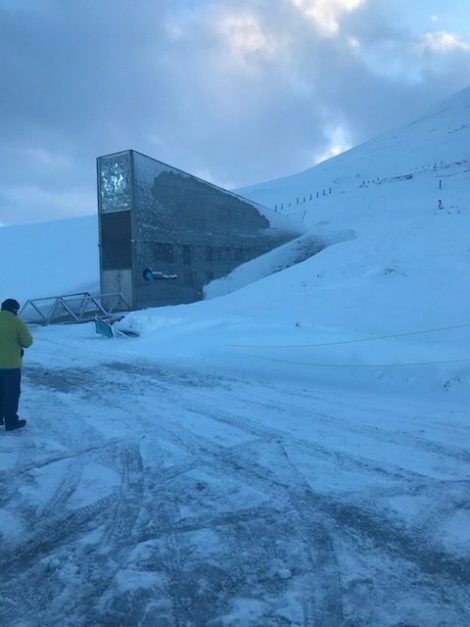 The Global Seed Vault is the second most recognized building in Norway, second only to the ski jump at Lillehammer, making it a great place for a selfie. Lovely piece, Lee. It brought an ( unfrozen) tear to my eye….. Thanks so much, Dee Dee….